TORONTO (July 3) – Though it’s been a long time, we’ve seen this act before with the Maple Leafs. The one that features a supplanted No. 1 goalie hanging around in dismay while his general manager works on moving him to another team. It creates a lousy distraction. And, it threatens to happen again. You may or may not be old enough to remember the Maple Leafs signing Curtis Joseph 16 years ago this month. It remains Toronto’s best free agent acquisition and still ranks among the top half-dozen UFA catches in the post-1995 lockout era. The Leafs were completely justified in making the move, as Felix Potvin had alarmingly regressed in the previous two years. Potvin, however, didn’t see it coming and it may not have happened if Leaf president Ken Dryden and Cujo’s agent Don Meehan had not legendarily bumped into one another while buying ice cream on a sweltering night. Meehan convinced Dryden the Leafs needed Joseph and ol’ Donny was bang on. 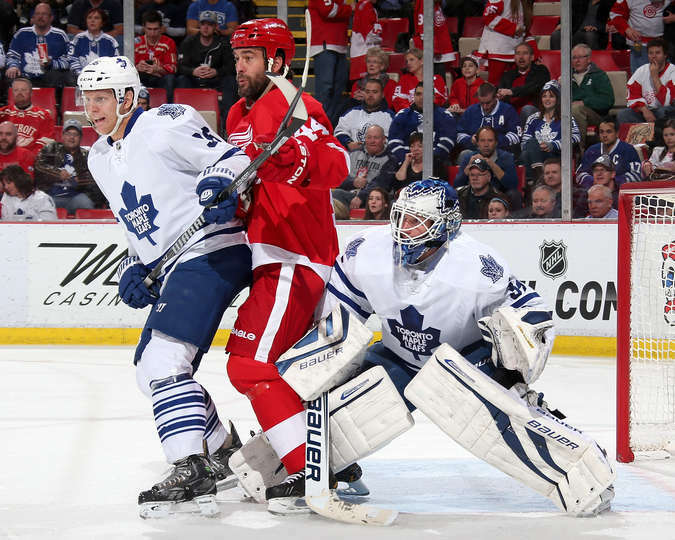 Cujo provided the club its best goaltending since Johnny Bower more than 30 years earlier and Leafs twice made it to the Stanley Cup semifinal (in 1999 and 2002). I was in my sixth of 17 years on the Leafs beat for The FAN-590 and l’affair Potvin became an obsession among those covering the team. With no deal in sight, the veteran goalie quit the Leafs in early December and went home to Montreal. Sadly, Smith had to contend with Potvin and the daily media barrage while his wife, Judy, battled cancer. It became so pervasive that the Toronto Sun began publishing a daily trade “watch” featuring Potvin and disgruntled Blue Jays pitcher Roger Clemens. “Who goes first?” asked the newspaper each morning. Under the steady guidance of coach Pat Quinn and captain Mats Sundin, and with the remarkable goaltending of Joseph, the Maple Leafs soldiered on throughout the mess and dramatically improved. The commotion finally ended nearly six months after it began when Smith traded Potvin to the New York Islanders on Jan. 9, 1999 for defenseman Bryan Berard. The uproar it created, however, would likely have derailed an inferior team. And, it all happened well before the advent of social media. That is why I feel it’s imperative for the Maple Leafs and Reimer to reach an accord as soon as possible. Neither party has anything to gain by entrenching itself. Granted the team is in a more difficult position than in 1999 when Healy provided adequate support for Joseph. With Marlies’ No. 1 Drew MacIntyre having joined Carolina as a free agent, the Leafs are razor-thin behind Jonathan Bernier. At this moment, therefore, Reimer is an absolute necessity for the Blue and White, though there’s plenty of time for that to change during the summer. If it doesn’t, Reimer is under contractual obligation to the hockey club in whichever role it chooses to deploy him. That doesn’t mean he’ll be happy – or should be happy. But his only outlet right now is to pursue arbitration and elevate the $1.6 million salary the Maple Leafs tendered as a qualifying offer to retain his rights. Restricted free agents in the National Hockey League have very limited mobility. I can guarantee that isn’t news to Reimer. But, neither is it productive for the Leafs to taunt Reimer with “facts.” He knows he isn’t going anywhere without being traded and the Leafs understand he wants nothing further to do with Randy Carlyle. Nonis reminding the media that his reluctant goalie is “a quality guy” and was “not far removed from having spectacular numbers” will be no salve for Reimer. Nor will it help the Maple Leafs avoid an uncomfortable and potentially disruptive situation at training camp in September. Nonis would far better serve the club by proactively seeking a qualified No. 2 stopper and an equitable landing spot for Optimus Reim. Some extra work now will save a whole lot of aggravation at summer’s end. The paradox in this matter is that no one has done anything wrong. The Leafs were fully entitled to conclude, last year at this time, that they needed an upgrade between the pipes – thus the trade with Los Angeles for Bernier. Carlyle, though he’s as delicate as sandpaper, had every right to utilize Reimer as he saw fit. And Reimer, being human, was understandably upset at losing the No. 1 role. But, hey, that’s life. Not everything works to perfection, whether you’re a store clerk or a goalie in the NHL. What’s required here is a meeting of the minds. If Nonis can assure Reimer he’ll do everything he can to find a trade match, Reimer should be able to assure the GM that he’ll honor his contract for however long it takes. I know both men and both are reasonable. This doesn’t have to grow into a repeat of Potvin vs. Smith.